Filippo graduated from the University of Bari, Italy, in 2001. He moved to the UK in 2003 and worked at the PDSA before joining the Royal Veterinary College in 2006 as Resident in Veterinary Dermatology. He gained the RCVS Certificate in Veterinary Dermatology in 2009 and has become a Diplomate of the European College of Veterinary Dermatology in 2010. Filippo has special interests in ear diseases and allergies; he strives to establish a referral service where patients receive individually tailored treatment programmes and where cases benefit from a multi-disciplinary approach to achieve the best possible outcome. 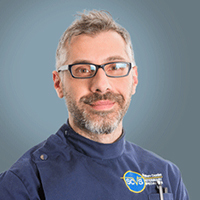 Filippo works as a clinician and is an Honorary Lecturer in Veterinary Dermatology at Liverpool University Veterinary School. He is a member of the British College of Veterinary Specialists and President of the British Veterinary Dermatology Study Group.